Thank you for joining me as we count down to the MFT release. We are just one day away from the big day! All the new Stamps, Die-namics, and Stencils will be available on Tuesday, April 4 at 9:00 pm EST. Be sure to check out the MFT Blog to see all the new items being revealed today. Don't forget to leave a comment on the MFT Blog countdown posts, YOU could win one of the five $75.00 gift vouchers. 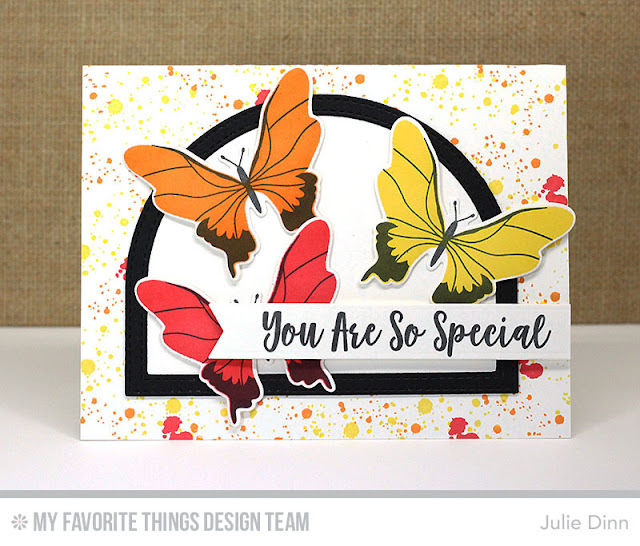 I know many of you have been waiting for the gorgeous Beautiful Butterflies stamp set and Die-namics to release. This popular stamp set is FULL of gorgeous butterflies. I stamped these in Daffodil, Orange Zest, and Red Hot Premium Dye Ink, with a Black Licorice Hybrid top layer. I used the amazing Distressed Patterns to create the background. The sentiment is from the coordinating You Give Me Butterflies stamp set. Very pretty Julie! I love the splatter background it looks amazing with this focal image and the dome. Your beautiful, unique colors repeated in the awesome background and butterflies are wonderful. This really cool. That dome die is such a hit. The distressed pattern stamp set is a marvel amazing thing. Your butterflies really POP in those bright colors! Great card. Really liking those new butterflies!